Cinnamon is among the most popular spices throughout the human history. It has been used for various purposes, from love potions, perfumes, a natural medicine, and a food addition. This age-old spice comes in two known varieties, Cinnamomum zeylanicum (Ceylon cinnamon) and Cinnamomum cassia (cassia). The cinnamon spice is made from the inner bark of a tropical evergreen tree, and id used as an addition to both, savory and sweet foods. It is delicious and nutritious and has a mid-brown color. Ceylon (or tree) is buff-colored and its flavor is a bit milder, while the cassia type has a reddish-brown color and its flavor is more pungent and bittersweet. The bark of this plant is usually harvested in the rainy season. When dried, this bark is curled into long quills. Next, it is ground as a powder or cut into lengths and sold as cinnamon sticks. In most countries, cassia cinnamon is sold simply as “cinnamon”, and it is used as an addition to curries, stews, and savory dishes, as well as sweet desserts. The cinnamon oil is also used for flavoring, as well as in the form of a natural medicine, and it is obtained from the pods of the cinnamon tree. Ants detest cinnamon, so if you sprinkle it around the garden beds, it will destroy them and keep them at bay. Also, add some cinnamon to all places you do not want ants to come near to! You can now forget about the chemical rooting hormones, and just apply the cinnamon powder to the stem when you plant the cut, and you will see the effects of the best rooting hormone ingredient ever! Your seeds can be a target of plant diseases, and the term “dampening off” covers the numerous plant diseases that attack them and cause their early demise. It is caused by various fungi and bad soil conditions. Yet, cinnamon is a potent fungus exterminator. All you need to do is to dust the fresh soil with this spice and you will prevent the seeds from dampening off. Sometimes, we accidentally cut and wound our plants. In these cases, quickly brush some cinnamon on the “wound” to stimulate healing and prevent infections. Mushrooms do not like the cinnamon spice as well. Hence, you can dust the wild mushrooms and weed from your garden beds with cinnamon, and they will disappear soon! 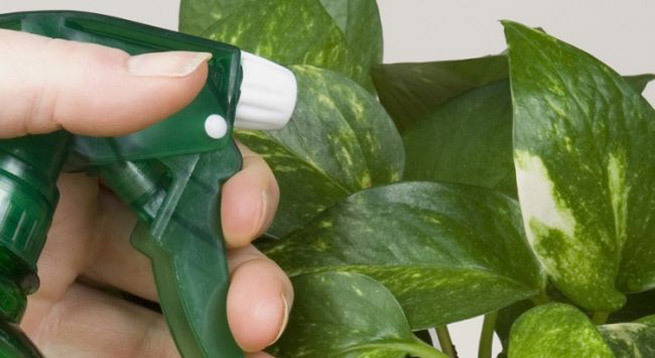 The beneficial cinnamon helps the elimination of harmful mold and mildew on your plants. Sprinkle some of it on the soil and you will see your house plants flourish quickly as well! Cinnamon will also get rid of gnats in seedlings and houseplants and keeps them at bay. Therefore, cinnamon is an inexpensive, natural way to protect your indoor and outdoor plants and stimulate their growth. Therefore, forget about the dangerous chemicals and start using this natural spice! Yet, make sure no one of your family or flatmates is not allergic to cinnamon before you use it on your plants, as the cinnamon powder is very strong and might lead to severe health issues.